We supply styles of loading dock bumpers intended for use on loading docks, dock equipment, trucks, and within the warehouse or home. 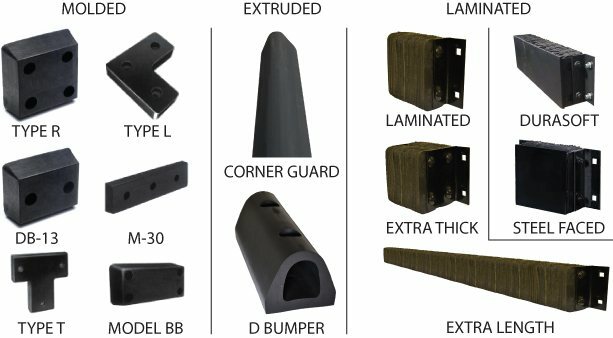 Choose from Laminated Bumpers, Extruded Bumpers, Molded Bumpers, or Steel Faced Bumpers. Need help finding the right dock bumper? Laminated Dock Bumpers are maintenance free, weather resistant, and prevent damage to trucks, loading docks, and buildings by providing protection against impact of the trailer backing into the Dock Sill. Click the picture to go to our Laminated Dock Bumper section. Uses: Loading dock protection, building foundation protection, rub rails, bumper stop, ICC Bar stop. Extra Length loading dock bumpers offer protection for the entire door size. These bumpers are available up to 123 inches wide, and come in a variety of heights and projections. Uses:Loading dock protection, bottom door seal, continuous dock face protection, building foundation protection, rub rails, bumper stop, ICC Bar stop. Extra Thick Dock Bumpers are the perfect product when greater stand out distance from the dock area is needed. Tough plies of rubber are layered to give superior impact resistance. Molded dock bumpers are great for low traffic dock applications and can be ordered in many different sizes. To visit our page of products please click the picture. Steel Faced Dock Bumpers are ideal for use in docking areas where excessive friction from up-and-down trailer movement occurs. The steel face gives the bumper at two times the life expectancy. These dock bumpers come in a variety of sizes. Extruded Dock Bumpers are appropriate for outdoor or indoor protection. Use them for commercial loading docks, parking garages, and marinas. Extruded dock bumpers are also used on tow trucks, trailers and heavy duty construction equipment. Choose from a variety of styles. Dura-Soft Dock Bumpers have an unparalleled ability to deflect and absorb shock with a loop design laminated bumper beneath a floating steel-face. Click the picture to go to our Dura-Soft Product page. Interested in opening up an account with Loading Dock Supply? Call 1800-741-1258 to see what loading dock supply can do for you!